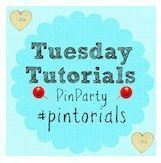 I'm very excited to be joining the Tuesday Tutorials Pin Party team; a wonderful linky which runs every Tuesday for instruction based posts of some kind, usually crafts, recipes or learning through play opportunities. The linky opens every Tuesday where I will share posts from the previous week's linky on a chosen theme. During half-term we've been having great fun cooking Welsh Cakes in order to celebrate St. David's Day on 1st March. There's definitely something about using cutters to help create the curranty goodness, and then wolfing them down straight from the bakestone with a cold glass of milk; certainly warms up the tummies on a chilly Winter's day! I love the layering in this Diddy Trifles in a jar, The Boy doesn't like conventional trifles because of the custard and jelly, but these puddings in a glass jar lend themselves to many ways of adapting the traditional recipe. Following the theme of puddings in a jar, this Caramel Apple Parfait is a healthy alternative to my favourite caramel apple betty. Granola, caramel yoghurt and chunks of scrummy apples are a perfect combination of textures and flavours. More sneaky fruit hiding is involved in these yummy and moist Banana Muffins and the very cute St. Patty's Pops, a genius way of hiding kiwis and oranges whilst celebrating the patron saint of Ireland's special day! And not forgetting the savoury recipes, this is bound to become a firm favourite with The Boy; Mackerel Goujons and Sweet Potato wedges. Fab idea! Hubby and I were just talking about how to mix meals up a bit as we seem in a rut with meals at the moment. (And you've definitely inspired me to buy a bakestone instead of relying on my mum to make our family supplies of welsh cakes 🙂 ). This is a great list! I'm sure I'll try some of these so have pinned for later.